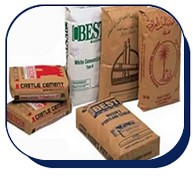 Sack produced from kraft paper allows for hot filling up to 85 ºC, automatic filling and mass use at site. Prevents pollution at site due to its environment friendly nature. Also provides for vivid, multi color and illustrative printing to best effectively reach to consumers at construction markets and hardware stores. And for similar products, 10 - 50 kg valve hexagonal bottom sacks are recommended.